Tagline: "They don't call them that for nothing"
In the summer of 1974, my family took a trip to the San Francisco area to visit my Aunt and Uncle. I was a few months shy of my 5th birthday, yet I remember, quite vividly, accompanying my father and uncle to a small convenience store one sunny afternoon, during which we passed a billboard advertising the movie Dirty Mary Crazy Larry (part of the reason this stuck with me over the years was that my uncle read the title aloud, and made a comment about how pretty Susan George was). A few weeks later, after we returned home, I was reminded of this incident when, while sitting in our living room, an ad for this same film popped up on television. Still, despite these early experiences with its advertising campaign, today was the first time I’d actually seen Dirty Mary Crazy Larry in its entirety, and while I wouldn’t go so far as to agree with my pre-five-year-old self that it was “the most amazing movie”, its dynamic car chases coupled with a handful of interesting performances made for a very entertaining watch. In need of some quick cash to overhaul their new vehicle, race car driver Larry (Peter Fonda) and his mechanic Deke (Adam Rourke) pull off a major heist, stealing thousands of dollars from a neighborhood supermarket. Alas, the pair’s getaway doesn’t go as smoothly as they hoped. First, Larry’s one-night stand, the attractive but ornery Mary (George), tracks him down - none too happy that he left without saying goodbye – and insists on tagging along with the two thieves. On top of that, Sheriff Everett Franklin (Vic Morrow) is hot on their trail, determined to bring all three of the fugitives to justice. But with a couple of souped-up cars at their disposal, as well as a detailed escape plan, Larry and Deke are confident that, even with their unwanted passenger, they’ll have no problem staying one step ahead of the law. Neither Fonda nor George are at the top of their game in Dirty Mary Crazy Larry. Fonda is too laid-back to be believable as a speed-crazy crook, and George (whose American accent occasionally slips) goes way over-the-top early on. But despite their mediocre performances, the two have an undeniable chemistry, and we root like hell for them to get away with the money. Faring slightly better is co-star Adam Rourke as the well-prepared sidekick trying to work through a few problems of his own; and the always reliable Vic Morrow is excellent as the cop who refuses to give up (ironically, Morrow spends a good portion of Dirty Mary Crazy Larry flying around in a helicopter, the very thing that would take his life a decade or so later on the set of Twilight Zone: The Movie). Also solid in supporting roles are Kenneth Tobey as the uptight Chief of Police (his run-ins with Morrow’s Sheriff Franklin bring an added layer of tension to the proceedings) as well as the uncredited Roddy McDowell, who has a brief but memorable appearance as the supermarket manager forced to turn over a great deal of cash to Larry and Deke. That said, the real stars of Dirty Mary Crazy Larry are its high-energy chases. Director John Hough got a bit creative when shooting some of these sequences, many featuring stunts that look plenty dangerous (in one scene, Larry, while trying to outrun the police, swerves into oncoming traffic, causing a pair of buses heading directly for him to scatter. Shot from inside Larry’s car, we see that one of the buses actually sideswipes him before careening off the road). Hough managed to generate tons of excitement with the film’s high-speed pursuits, a few of which clearly inspired key moments in Quentin Tarantino’s Death Proof, his entry in 2007’s Grindhouse (the final chase in that movie is surprisingly similar to a scene in this one). 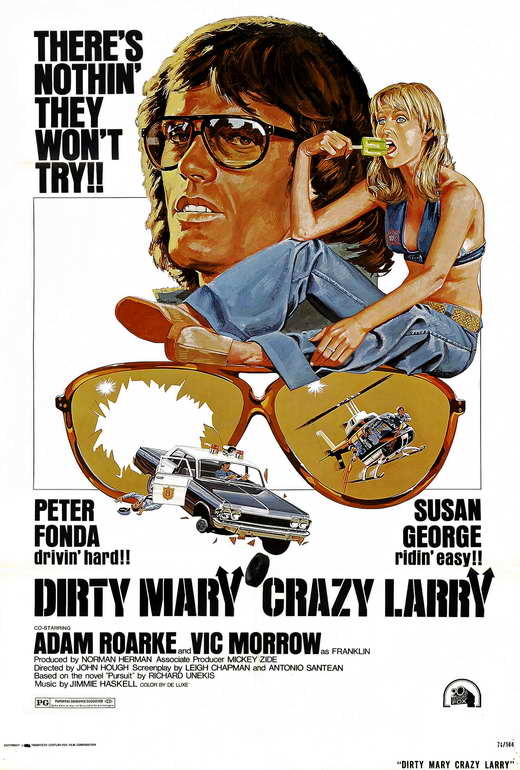 So even though it took me 40+ years to get around to watching it, I’m happy to report that Dirty Mary Crazy Larry was well worth the wait! I got to see the movie when it was in the theater. I was twelve and I think a drive-in and the trunk of a car was involved. This movie scared the crap out of me when I was a kid. I don't know why but I just found it very disturbing.